Lilla Gladys [Gilchurch?] sweetly sang a solo with Mrs. Kingsland, accompanist, opening the literary part of the session. Mrs. Robert Lincoln [illegible] the union by relating some of her experiences with other union in leal. The death of one of out members Miss Georgie Turner was lamented and regretted by those in attendance. Our president making mention of our departed sister and unexpressed sorrow seemed to abound. Our interest [illegible] of medal contest on the Presbyterian church was given in which Miss Hamilton won the medal. A collection of $3.72 was reported. A drive for membership was urged. Three new members united with us at this meeting. Mrs. Kingsland Mrs. [Arla?] Evans and Mrs. Ed Boldsteadt The May 16, 1922 meeting of the Grimmel's W.C.T.U. met at the Eng. church. 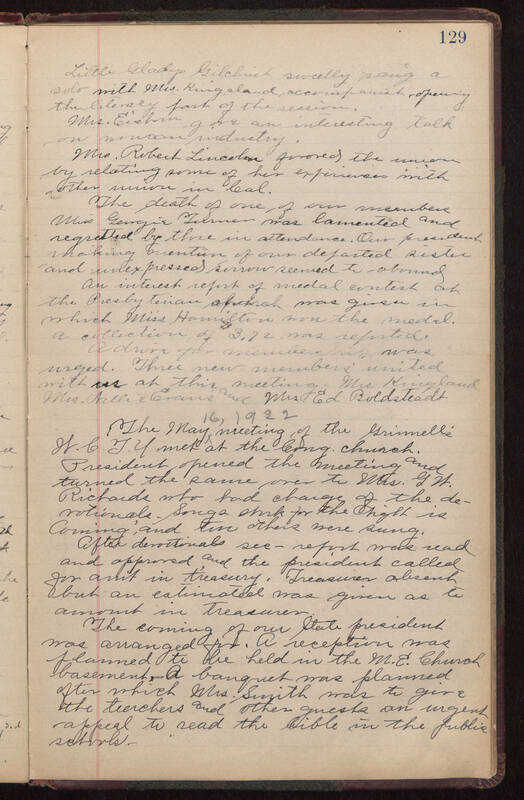 President opened the meeting and turned the same over to Mrs. GN Richards who had change of the [illegible]. Songs [illegible] for the Eighth is Coming, and five others were sung. After [illegible] see - report was read and approved, and the president called for audit in treasury. Treasurer absent but an [illegible] was given as to amount in Treasurer. The coming of our State president was arranged for. A reception was planned to be held in the M.E. Church basement. A banquet was planned after which Mrs. Smith was to give the teachers and other guests an urgent appeal to read the bible in the [illegible] schools.